Dutchman Rinus ‘Veekay’ van Kalmthout continued his scorching form to take Asian Winter Series win number four in Race 5. Title rival Ye Yifei of China appears to be the only driver so far able to halt the Ice Man’s run, snatching the Race 6 victory from the pole-sitter and crossing the line with a staggering margin of more than 11 seconds. Ye finished second to the championship leader in Race 5, while 17-year-old Frenchman and Veekay’s Hitech Grand Prix team mate Alessandro Ghiretti continued his impressive graduation from Formula 4 to complete the podium after both races. Veekay’s win and second place finishes put him on 133 points in the Asian Winter Series championship race, but Ye’s matching results mean the gap between the pair remains at 29 points after six of the nine races. 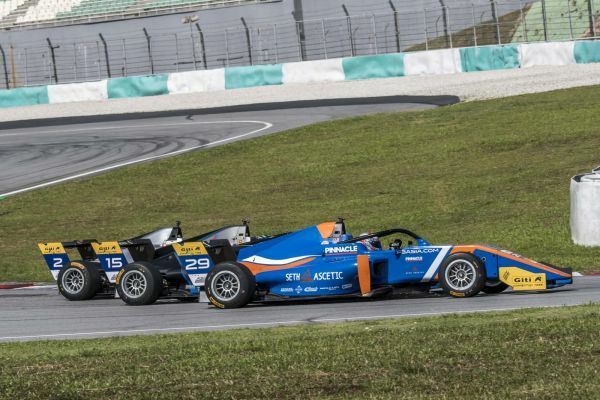 Ghiretti remains third with 73 points after the Malaysian weekend, while Super License driver Tomoki Takahashi climbs to fourth on the leaderboard after rebounding strongly from the challenging start to the weekend. The Japanese driver is tied on 44 points with Pinnacle Motorsport’s Akash Nandy, ahead of Hitech Grand Prix’s Pavan Ravishankar. Pinnacle Motorsport’s David Schumacher drops down the order to seventh, tied on 43 points with Ravishankar, after misfortune struck in Race 6, resulting in an early retirement. 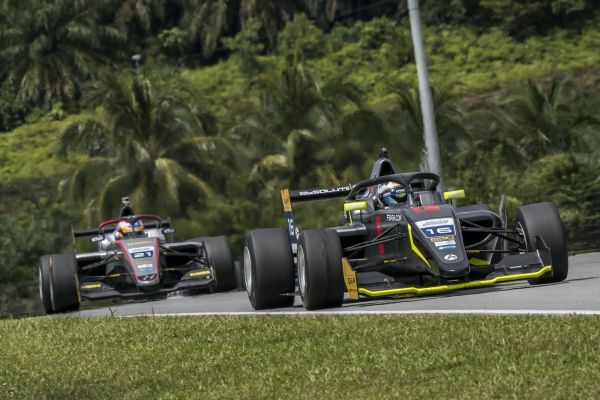 Hitech Grand Prix’s Dan Ticktum is eighth ahead of Absolute Racing’s Eshan Pieris while Pinnacle Motorsport’s Amaury Cordeel rounds out the top 10. In the Masters class, Tairoku Yamaguchi retains his lead ahead of B-Max Racing team mate DRAGON, and series newcomer Motoyoshi Yoshida. 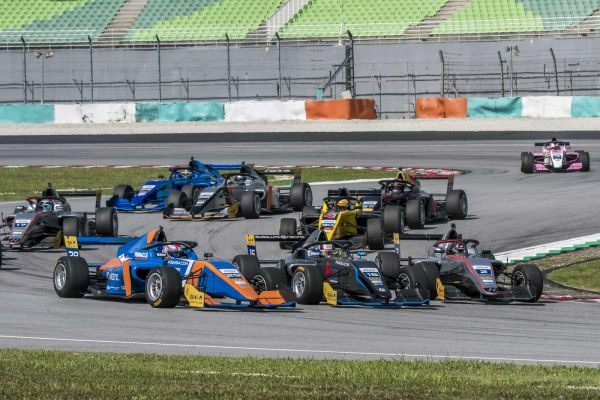 The Asian Winter Series returns to the 5.543km Malaysian Sepang International Circuit for its third and final round next month, with Races 7-9 from February 22-24. Veekay was away like lightning from pole, immediately pulling clear of the chasing pack. Ye tried hard to stay with the Dutchman but, with the pair so evenly matched on pace and the Chinese driver in dirty air, his efforts to even get close to the championship leader were in vain. Veekay pulled a gap which he masterfully controlled all the way to the chequered flag, taking the win with a margin of 2.585 seconds. Behind Ye, Ghiretti initially had to contend with an on-form Takahashi, who also had a quick getaway from the second row of the grid. The Frenchman managed to pull away from Takahashi, and initially tried to give chase to Ye and Veekay up ahead. Behind Takahashi, Ravishankar had also made good progress to climb to fifth from eighth on the grid. An early-race incident between Cordeel and Masters class points leader Yamaguchi saw both drivers retire. Behind the front-runners, frenzied dicing for position off the start saw both series newcomer Max Fewtrell and Hitech Grand Prix team mate Ticktum on a charge from the back of the field. Ticktum tore up through the order and had dived into sixth by the end of the opening lap. Fewtrell, meanwhile, had worked his way up to eighth behind Nandy. For Nandy, it was to be an eventful race. First he had to contend with the hard-charging Fewtrell, who found a way past on Lap 5. Next the Malaysian had Schumacher in his mirrors. Fewtrell, Nandy, Schumacher and Pieris, who had lost ground off the start from sixth on the grid, provided some of the race’s most intense moments. Ticktum, meanwhile, continued his charge. The Briton passed Ravishankar to go fifth, having got the better drive out of the corner, and set off on the hunt for Takahashi. Ravishankar next fell into the clutches of Fewtrell, the Singapore driver putting up a strong defense against the Briton but eventually conceding the place. Schumacher eventually found his way past Nandy on Lap 7 to climb to eighth in the order, with the German next reeling in Ravishankar. As the minutes ticked away, Schumacher continued to pile on the pressure, with Ravishankar locking his wheels as he came under fire but defending well. The pair put on a superb display of racecraft in an intense dog fight which went all the way down to the final turn before the flag when Schumacher finally made his move stick to cross the line in seventh. Keszthelyi, who had started from pit lane after a pre-race issue, finished 11th, while DRAGON took his first Asian Winter Series Masters class victory ahead of team mate Motoyoshi Yoshida. As the lights went out, Veekay got away well, but this time Ye was able to stay with the Dutchman, grabbing the race lead at the first turn and setting off to put some air between them. Ghiretti once again got away well, but wasn’t able to stay in the mix for the lead, but quick enough to keep clear of the chasing pack. The mid-field was once again saw frenzied jostling for position, with Fewtrell and early mover, climbing from eighth on the grid to fourth in the order. An incident between Schumacher and Cordeel ended the race prematurely for the German. His stranded car brought out the safety car, closing up the field and seeing Ye lose his advantage at the front of the pack. When the safety car pulled off at the end of Lap 2, Ye controlled the restart perfectly, putting the hammer down and immediately pulling away. Behind him, Ticktum dived on the inside of Pieris before getting by Takahashi almost immediately and lining up Nandy in his sights. With 16 minutes remaining on the clock, Ticktum made a move on Nandy to go fifth behind team mate Fewtrell. Further down the field, Keszthelyi was skillfully holding Cordeel at bay, resisting repeated challenges from the Belgian. Amongst the Masters challengers, DRAGON was also holding his own against Yamaguchi in a close-run battle. In the closing laps, Ticktum took a look up the inside of Fewtrell, but didn’t make the move, locking his wheels in frustration. In the closing seconds, the Briton lost a place to Nandy and was handed a 10 second penalty for overtaking during the earlier safety car period. That put him down to ninth on the results sheet after crossing the line in sixth. Ye, meanwhile, sailed to his second Asian Winter Series well clear of Veekay, who had struggled with understeer after front wing damage on the opening lap. Ghiretti took his fourth podium of the season ahead of Fewtrell, Nandy, Pieris and Takahashi. DRAGON took the Masters win from team mates Yamaguchi and Yoshida.